Eritrea is a country on the eastern coast of Africa. Its official name is The State of Eritrea. 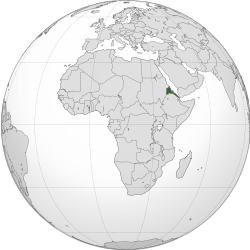 Eritrea is located on the coast on the Red Sea. It is north of the Bab-el-Mandeb and the Horn of Africa. Eritrea has borders with the countries of Sudan, Ethiopia, and Djibouti. The land area of Eritrea is 101,000 km², and it is one of the smallest countries in Africa. The population of Eritrea is about 5.6 million. About 0.5 million people live in Asmara. People from Eritrea are called Eritreans. Most of them speak Tigrinya or Tigre as their first language. The people usually use Tigrinya or Arabic for official business. Eritrea has nine ethnic groups. These are the Afar people, the Bilen people, the Hedareb people, the Kunama, the Nara, the Rashaida, the Saho, the Tigre, and Tigray-Tigrinya. The currency of Eritrea is called the Nakfa. Eritrea is a very poor country. Almost half of Eritrea's economy comes from Eritreans who live abroad. They send money home to their families. Most of the rest comes from farming. Football and cycling are the most popular sports in Eritrea. In recent years, Eritrean athletes have also seen increasing success in the international arena. Eritrea became an independent country on 24 May 1993. It is one of the newest countries in the world. Many different countries have ruled the land that is now called Eritrea. Between 1885 and 1941 it was a colony of Italy. Between 1941 and 1952, the United Nations put it under the protection of United Kingdom. After 1952, Eritrea became a part of Ethiopia. This was the reason for a long civil war between the Eritreans and the government of Ethiopia. Eventually, in 1993, Eritrea became an independent country after a vote by its people. Eritrea is known for being the most oppressive country in Africa, sometimes considered to be the "North Korea of Africa". The nation has been accused of many human rights violations, severely limited freedoms, and many arbitrary (made-up) arrests. Wikimedia Commons has media related to Eritrea. ↑ 1.0 1.1 1.2 1.3 Hailemariam, Chefena; Kroon, Sjaak; Walters, Joel (1999). "Multilingualism and Nation Building: Language and Education in Eritrea". Journal of Multilingual and Multicultural Development 20 (6): 474–493. http://www.chr.up.ac.za/chr_old/indigenous/documents/Eritrea/Report/Multilingualism%20and%20Nation%20Building%20Language%20and%20Nation%20Building%20in%20Eritrea.pdf. Retrieved 2012-04-04. ↑ 4.0 4.1 4.2 4.3 "Eritrea". International Monetary Fund. Retrieved 2012-04-18. ↑ 6.0 6.1 6.2 6.3 6.4 "Eritrea". Central Intelligence Agency - The World Factbook. Retrieved 2008-08-25. ↑ Halper, Yishai. "'The North Korea of Africa': Where You Need a Permit to Have Dinner With Friends". Haaretz.